In a surprise visit to the weekly event, Nissan appeared with a lineup of vintage classics and current street machines. Check out video of the event. The 2013 Nissan 360 media event is happening right now in Southern California at the former Marine Corps Air Station in El Toro. Just up the street, a weekly meeting of car enthusiasts happens every Saturday morning as the Cars and Coffee get together in Irvine, California. Nissan decided to crash the event with some of their own classics and new concepts. "Hundreds of cars come in from all over the region here at Cars and Coffee just to hang out, have coffee, talk about cars and meet with friends," said Richard Plavetich, Nissan Design America. The cars that gather are a mixture of vintage hot rods, new sports cars, classics, retro rides, exotic vehicles, and more. If you can name a make and model, it has probably appeared at Cars and Coffee at one time or another. 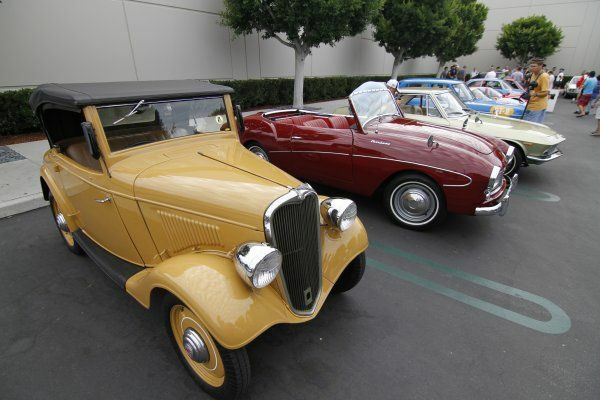 On Saturday, though, Nissan decided to show up in style, with a lineup of cars from the company's past and present. "We thought, hey, we have all of this cool product brought over in conjunction with Nissan 360, heritage vehicles you would never see outside of Japan, let's bring the cars to where the public can have a look as well," said Plavetich. "If you look at the Nissan Fairlady, and you go back to the roots of that car, it is really the roots of what we have in the Nissan 370Z today. It is very fun to have something like that around for inspiration."